Richard Kadrey is guilty of attempted murder. He is trying to give me a heart attack. Me and all the other readers of the Sandman Slim books. He just won't let up on the adrenaline he infuses in this Urban Fantasy series and Aloha From Hell is the worst and most exciting culprit yet. 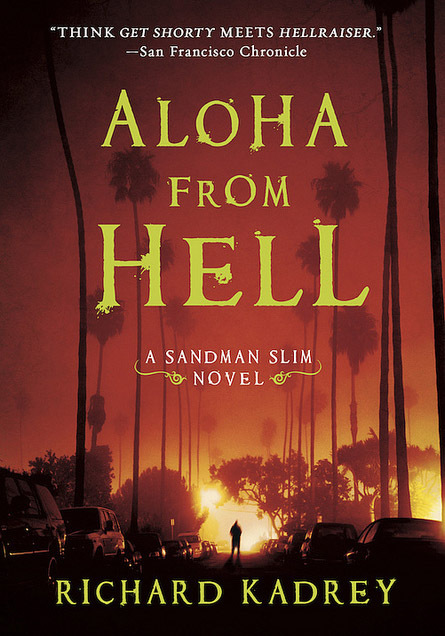 Aloha From Hell sees Stark aka Sandman Slim trying to more than live up to the hype as he dives back into Hell on a quest to confront all the baddies he left behind and sent there. If you thought Stark showed his blood-thirst in the first two books you haven't seen anything yet as he flashes to the beast he was when first sent to Hell and everyday was a fight for survival. Given the big reveal found near the end of Kill the Dead I was expecting Aloha to show a different side of Stark. A side I wasn't necessarily looking forward to, but Stark still keeps his attitude going despite his lighter half arguing along the way. Stark is still the most capable monster out there. Aloha is much closer in tone to the first in the series than Kill the Dead as it showed Stark getting a bit too buddy-buddy with a lot of people. That isn't him. He's a loner. Aloha gets him back on track and brings it all to a strong finish despite throwing in a completely unneeded tag-along partner for too many chapters that could have been done without. There are still a loose threads left open for more in this series, but we get closure on a lot of Stark's past leaving him open to face his future. Kadrey's version of God also takes the stage and He is nothing like you've seen before. Dark. Disturbing. Funny as hell. 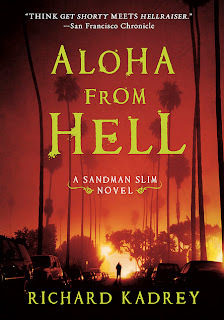 Three things that don't usually come in the same package, but Aloha From Hell delivers it all. Kadrey will be writing at least a couple more Sandman Slim books as he signed a new contract. Bring it on. Nice. Glad to hear the series keeps it going. Stark is such a badass. After reading the first two books in this series I was eagerly anticipating the release of this one when those wonderful folks at Amazon decided to offer me a pre-release copy. Snatched that up straight away. And finished it in one day. Now I'm chomping at the bit for another one. Kadrey's a freaking amazing author, think Jim Butcher with tats and a darker, twisted sense of humor.